Chapters postulate what will happen should the Earth get one, two, three, etc. 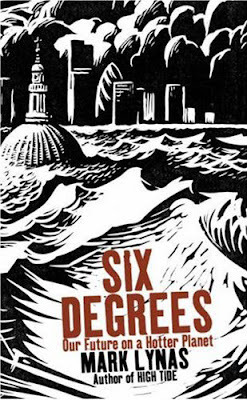 degrees hotter, with six degrees resulting in apocalypse. Two things I really like about this cover: 1) instead of a photoillustration of a swamped city, using an older illustrative technique like woodcut hints at the nasty future while referencing the past. In other words, that Mac Pro ain't gonna work under water. 2) The slightly askew text bobbing on the water clearly nails the premise of the book: shape up or (literally) ship out. Anyone know the illustrator? I'd like to see more stuff. This is an excellent cover and I think you nailed it with the idea of the woodcut having the impact. It's beautiful - I got my copy yesterday, and the illustrator is Chris Wormell. Even better, the cover is printed and textured like a linocut or woodcut, in that the black sections are slightly recessed. It's also a bloody good (but scary) book! Designer Nick Shah, Art Director Julian Humphries. This cover is great design. I don't love the typography though - I didn't read the angle as floating. I might like it better if the title and author were both upper case and burnt red, while the subtitle and author of were black... It looks jumbled to me now.